Some Prairie Fleabane – Erigeron strigosus growing just off the mown area of our lawn. Elizabeth says that if I ever get fleas, she’ll try using this to dust me off. There are enough insects biting me already this summer so, I’m not going to try finding fleas this year. This is Narrow-leaved Vervain – Verbena simplex. Its flowers are very small. Elizabeth says we’ll need to wait ’til she gets a macro lens for a close-up. And in the post-flowering phase, we found this tree practicing to be a Victorian Christmas Tree! We thought it was very beautiful, although I got a crick in my neck trying to get a good view… these only seem to grow at the very tops of the trees! 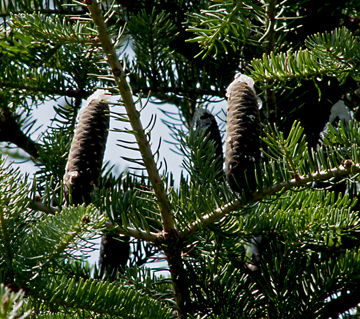 These are Balsam Fir – Abies balsamea cones (the tree’s female flowers turn into these when they are pollinated. So, I am staying on topic. Sort of…). They are really big this year – about 10 cm (4 inches) tall – and the tree sap is bubbling out the top of them. It looks just like wax on a candle, but Elizabeth says it is very, very sticky and hard to remove when it gets on you [pumice and detergent used together work to a degree]. Sometimes, in the wind, the sunlight catches a bit of crystalised sap just right and you can see a candle flame, too! Seriously, though, neither Elizabeth nor I have heard that. We will investigate!